James Bramblett on Chief Hawkeye. 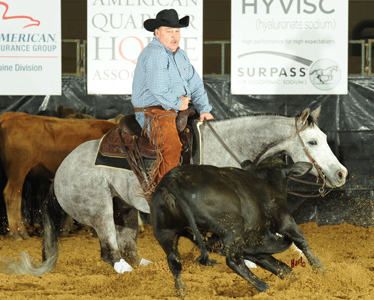 James Bramblett of Vine Grove, Kentucky, claimed his first major win Monday in the $35,000 Non-Pro finals at the 6666 Ranch NCHA Eastern National Championships in Jackson, Mississippi. Bramblett rode Chief Hawkeye, marking 221 to prevail over Cory Lowery on JM Sky Mate. Chief Hawkeye was bred by Jack and Susan Waggoner by Cats Red Feather out of Aristolcrat, whose offspring have earned more than $270,000. The 8-year-old gelding was reserve champion of the Brazos Bash in 2009 and has earned more than $50,000. Bramblett also showed the gelding in last year’s $15,000 Novice Non-Pro finals at the Eastern National Championships. At this year’s show, he was also a finalist in both the $2,000 Limit Rider and the $15,000 Amateur, riding Dualing With Desire.